Looks like the dry air has reached Warwick and Toowoomba. The point I was making was that you can get good rain events along the east coast even when there is a 'H' in the Tasman Sea. A good 'H' can help inject moisture from the Coral Sea into coastal troughs and sometimes even anchor them through our region. They can also play a role in blocking such low pressure systems (like Oswald) from escaping off the east coast and out into the graveyard. I agree with your second statement for sure but I still think it's important to remember that there is a difference between say January's ridge and the ridge that set up last week. January's ridge was bone dry because it had no depth and it kept being re-enforced by highs coming across the bight. Last week's ridge was a more traditional summer high that set-up across the southern Tasman Sea and actually gave us some moisture...it's just a shame there were no real upper level troughs for it to feed into. Obviously, even those highs can be serial pests if they just sit there for weeks as you say, but my point is that they aren't all bad as it also depends on the other dynamics surrounding them. Well I am going to launch a crusade to teach those butterflies to flap their wings at the correct time. They are flapping at the wrong time at the moment. Those cells are throwing out a few bolts of lightning now. Showing up on Storm Tracker. Hearing a bit of thunder from the cell NW of Brisbane. Don't think it will be a drought breaker though! Thunder to west of Wynnum North 1503K. Not much to speak of from that at Woolloongabba - bit of thunder, just enough rain to push the dust around a bit. Looks like my comment about lunch time about needing a temp of 36 deg to MAINTAIN a TS locally is ringing true. Thunder reported 10 mins ago has stopped and radar has verified this - the seabreeze wins again. Same here couple of mm at best. Sun out again here now. Just drove through that "thunderstorm". Very heavy rain and bright sunshine at the same time. The reflections were blinding. Just emptied my rain gauge and 13mm from that thunderstorm at Indooroopilly. Part of the time there was still sunshine. Temperature has barely budged under that storm, but the DP has rocketed up to 25. Feels like FNQ here right now, absolutely tropical. 39.5C atm Damn hot & dry! we got zilch at Salisbury from the “storm” being mentioned... i’ve been digging post holes in the backyard this afternoon and didn’t even realise a storm was passing through Brisbane, let alone dropping 13mm at a location 10 minutes drive away. I saw a patch of grey in the sky, but nothing heard and the sky didn’t even look storm like where I could see. Just had a few rumbles, a sprinkle of rain and some very cooling wind here at Bracken Ridge. Awesome stuff. Sorry you missed out Namarrkun. You probably lost a couple of kilos in sweat. I just mowed the front lawn ( dust bowl with weeds) and that was hot enough. Looks like this one has enough north/south path in it to get past that storm killing area for us behind Bald Knob. I just drove from Toowoomba to the Sunny Coast via Esk and Kilcoy. Got a few snaps of this cell in the very early stages of development. Had planed to sit up at Bald Knob Rd and watch it build a die before my eyes, but all the parking spots where already taken at 4:15. Going to sleep with heavy rain on a tin roof always makes for ‘wetdreams’…. Good one wetdreams, it's coming down here in our Diamond Valley - oh, wait a minute, it just stopped. Edit: we just caught the edge of that first one from the south, which looks like it's giving the village a fair whack. The Kilcoy one behind it looks better for us, but it hasn't gone over the 'storm killer' that is Bald Knob. I hope the inland dust thins out a bit by the time it gets close to our region tomorrow. 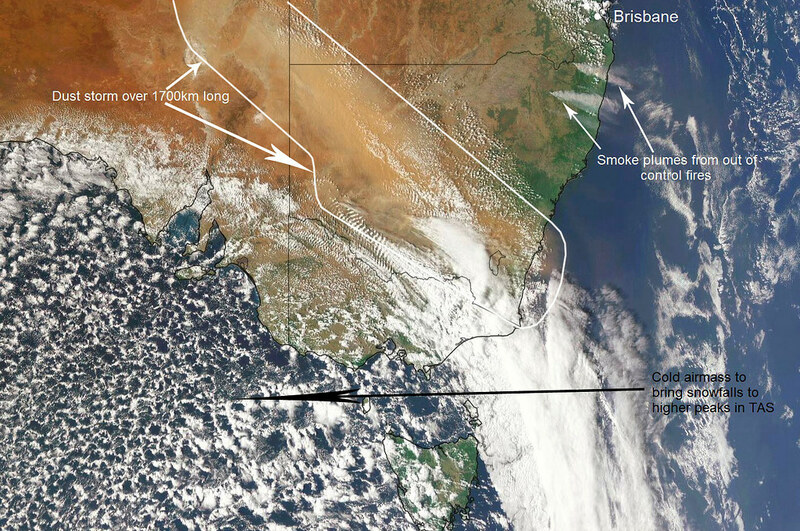 The smoke plumes from the big out of control fires near Tenterfield, Inverell, etc have been pretty noticeable on satpics and radar too... lots of photos of big pyrocumulus building up over the fires as well. Latest multiweek EC ensemble is in and it's still suggesting high probabilities of drier than normal conditions covering the majority of Australia during the next 2 to 3 weeks although the lower east coast (including us) is more undecided (could be wet, dry, or neutral). 1 registered (snoopydoo), 63 Guests and 2 Spiders online.